"The meend, taan and gamaks were impressive"
Sanhita Nandi is one of the most acclaimed artists of Hindustani Classical Vocal, of current times in Kirana Gharana. She received her training under the able guidance of the Kirana Stalwart, the Late Pandit A. Kanan from ITC Sangeet Research Academy,Kolkata. She also received guidance for few years from Pandit Vinayak Torvi. To further enrich the wealth of her Kirana Gayaki and enhance her repertoire of traditional compositions, she came under advanced tutelage of Ustad Mashkoor Ali Khan and continues to hone her fine musical skills under him. Her style is characterized by sequencing of melodic; Raaga Bhava enriched Merukhand patterns in Vilambit (slow tempo), executed primarily through tonal embellishments such as Meends(glissando), Kan swaras (fractional notes) and elegant use of Sargam. Apart from being a puritanical practitioner of raga structures and grammar, she brings in a unique soulful touch to her Gayaki through emotion rich, nuanced expressions and intonations. This makes her performances extremely poignant and soul stirring. The depth and profundity of emotions in her music transports her audiences to a different plane of musical bliss. The central motif of her gayaki is the raga development in leisurely slow tempo,deeply filled with emotional content and appeal, ornamented appealing Sargams and exposition of “Khayal and tarana” with magnificently imaginative “Taan” patterns. “A musician must be able to explain and clearly visualize every musical phrase that he/she composes” says she.” We need to not only develop Ragas based on grammar and phrases, need to get over the purely mechanical development and take music to the next level only then it can touch the hearts and souls of people and change them forever” she explains further. Sanhita Nandi is currently based in New Jersey (USA) and New Delhi (India) and performs frequently in India and abroad at all the prime music festivals and concerts. 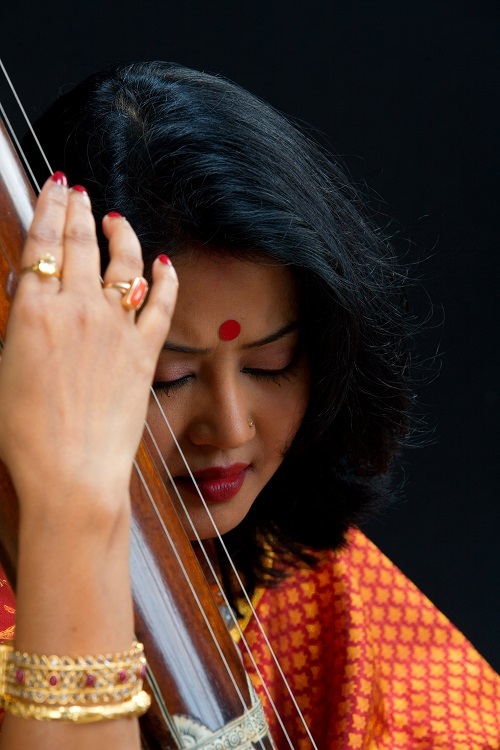 She has received great recognition and reviews on her mastery over the delivery of pitch, tonal precision, use of microtones and tone-fragments, the main characterization of Kirana Gharana. Sanhita Nandi also holds a dual degree in Music & History with a Master’s degree in World History. Sanhita Nandi rendition of Raag Multani, the popular afternoon and mature raag in the Hindustani system. She follows this consistent approach,wherein the Kirana musicians specialize in systematic exploration in the Vilambit Khayal (slower composition) with an effortless generation and flow of melodic ideas. A special episode of Shakhsiyat on Rajyasabha Television with renowned Classical Vocalist, Sanhita Nandi.